Perhaps you’ve noticed a bit of activity online the last few days related to a certain not-quite-pandemic bug that’s going around. Or, to put it in microblogging terms, #swineflu. The wonderful thing about the ease of communication online is that anyone can start a discussion, carry it on, pass along information, retweet it, forward an e-mail, leave a comment on a blog post, or bookmark a page in a social way. The problem, of course, is that when millions of people are desperately looking for solid, clear information, that’s when it can be the most difficult to find it. 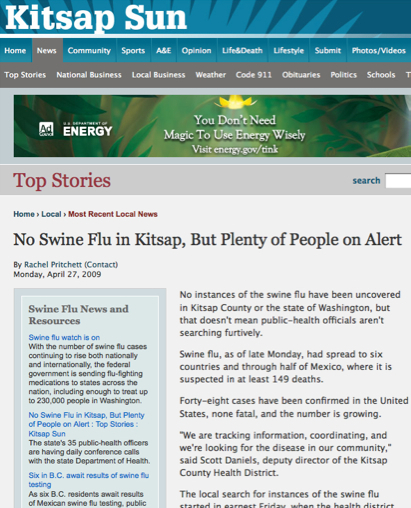 The #swineflu hashtag on Twitter serves as a good point of reference for what Clay Shirky called “filter failure.” The problem is not that there’s a wild abundance of useful information, overloading us with detail, facts, and commentary; the problem is that we don’t have the proper filtering system set up to separate trusted sources and reliable resources from rumors, jokes, misinformation, and ephemera. If those seeking to provide links to reliable information started using a hashtag such as #therealswineflu, it would likely be overtaken — quickly — by tagged content with less value, whatever its source. So how do we solve filter failure? When it comes to reliable sources for news that breaks on a massive scale, our best sources are likely to be Wikipedia for facts, and journalists for explanation, clarification, context, and meaningful analysis. One way that journalists are bringing explanation, clarification, context, and meaningful analysis of the Swine Flu story to their readers today is through Publish2. We’ve been actively encouraging journalists and news organizations using Publish2 to use the swineflu tag to mark the stories and resources they’re saving to help their readers understand what they need to know about this outbreak, put it in context, and quickly respond to it as necessary. Look for the “Create Widget” link near the top of every topic page on the Publish2 site to embed any stream of links on your own news site or blog. The Knoxville News-Sentinel added the stream of all Publish2 links tagged with “swineflu” on a page to gather resources from around the Web. So that’s one filter: Journalists sharing reliable information to serve their readers. Want to drill down a little more? How about a regional group of journalists at different news organizations gathering information in a collaborative effort to serve local readers? In the Pacific Northwest, #wanews has you covered. This group of reporters and editors in and around Washington State first came together to use Publish2 to aggregate news and information when flooding hit the area earlier this year. 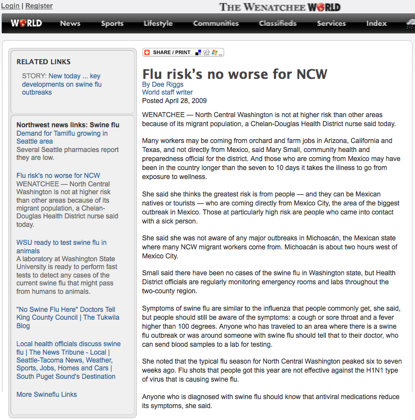 The Wenatchee World embedded a “Northwest news links” stream in the sidebar of their stories about Swine Flu. 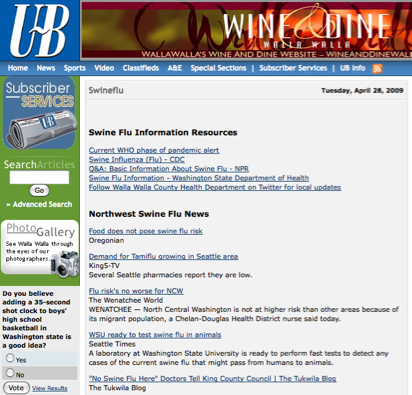 The Walla Walla Union-Bulletin added the feed of links to a special topic page where they’re providing Swine Flu information to their readers. The Kitsap Sun did both, with a sidebar on story pages and a stream embedded on a topic page as well. Solving the problem of filter failure isn’t a small task. Want to help out? Register for Publish2 if you’re a journalist who wants to pitch in by bringing the best of the Web to your readers.